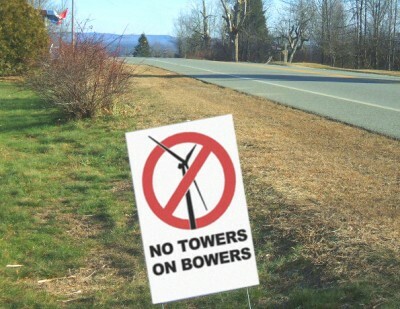 Carroll Plt, Maine – December 11, 2012 – Boston-based wind developer First Wind is facing growing opposition to its second attempt to build an industrial wind project on Bowers Mountain in the scenic Downeast Lakes Region of Maine. In a related development, Maine Department of Environmental Protection (DEP) Commissioner Patricia Aho announced that DEP will hold a public evidentiary hearing on the application. More than 1,000 people have signed a petition opposing the project. In a Special Town Meeting the Village of Grand Lake Stream voted unanimously to oppose the project. In Carroll Plantation, where most of the project’s turbines would be sited, opposition is also gaining ground as residents learn about the downside of hosting an industrial wind facility in their community. Reflecting the growing opposition to the latest Bowers Mountain Wind project application, more than 1,000 people have signed a petition organized by the Partnership for the Preservation of the Downeast Lakes Watershed (PPDLW). In addition to regular visitors to the area, the petition has been signed by scientists, state lawmakers, commissioners and conservation groups. At the foot of the Downeast Lakes Region, south of the project area, lies the quaint Village of Grand Lake Stream. A popular destination for outdoor sportsmen, the residents have long fought to protect the region’s wilderness character from development. In 2001 they created the pioneering Downeast Lakes Land Trust that was recently profiled in a documentary entitled “Forests and Lakes – For People – Forever,” part of PBS’s Visionary series. Meanwhile, to the north, in Carroll Plantation, opposition to the project is growing despite First Wind’s promise of community benefits. A group of Carroll residents has formed a group to oppose the project, Carroll Citizens for Bowers Mountain. “The more we learn about this project, the less we like it,” says John Miller, a Carroll resident whose home is one of several on Route 6 that will have a view of all 16 turbines. On December 2, 2012, the Maine Professional Guides Association voted to reaffirm their position against the Bowers Mountain Wind project. The Maine Professional Guides Association is the largest and oldest organization of Maine guides, with over 1,000 members and a 33 year history. Opposition like that aimed at the Bowers Wind Project is playing out across the country. Wherever developers propose wind projects that threaten valuable scenic viewsheds there is sure to be a battle. According to National Wind Watch, an organization that monitors the wind industry worldwide, well over 200 grass-roots opposition groups have sprung up in the U.S. in response to wind projects. PPDLW’s website lists 14 such groups in Maine (http://www.ppdlw.org/resources.htm ). First Wind’s initial application for the Bowers Mountain project was denied in April, 2012 when Maine’s Land Use Regulation Commission voted unanimously to reject the project due to its unreasonable adverse scenic impact on several scenic Downeast Lakes. After the state legislature concentrated authority for permitting wind projects in Maine’s Department of Environmental Protection (DEP), First Wind reapplied with fewer but taller turbines that PPDLW maintains will have a similar scenic impact. The 48 MW project would have 16 turbines, 460 feet tall, that would be built on hills and mountaintops overlooking the scenic Downeast Lakes Region. On December 7, 2012, DEP decided to hold a public hearing for the wind project. According to a letter to First Wind, DEP’s decision was made in the interest of fairness, based on the fact that this project is a modified version of a previously-denied project that was subject to public hearings. This is the first industrial wind project for which DEP has agreed hold a public hearing, as opposed to public meetings.